Many of you know how much I LOVE textiles! 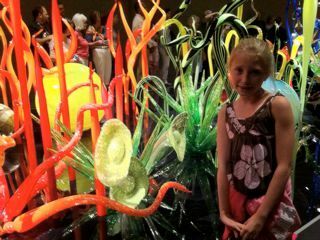 and I was completely overwhelmed upon an impromptu visit to the Museum of Fine Arts in Boston this summer when I saw the entrance to a very extensive Chihuly exhibit. Wow! 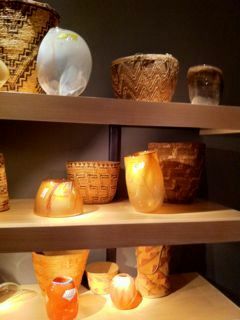 The glass vessels were presented with native american baskets and large slabs of wood. 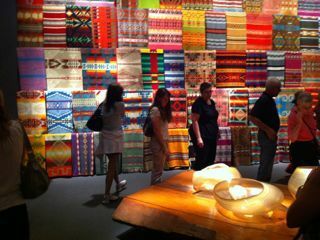 All of this was framed by the back wall with South American textiles draped on the entire back wall. 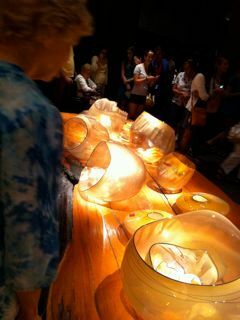 The show was extensive and had much of his fanciful, colorful pieces as well. It's the first time I've been in the museum and was in a que to enter. When we left, the museum was open late that evening and the line went around a city block to enter.